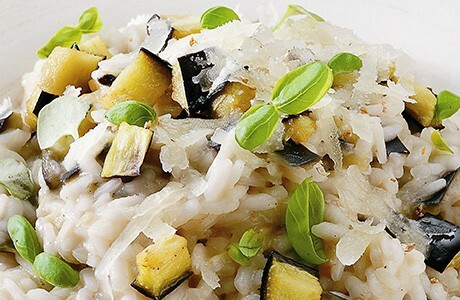 Aubergine is a common staple in Mediterranean cuisine and its simple, slightly smoky flavour compliments this creamy risotto perfectly. In a pan heat some olive oil then add the aubergine cubes and fry until golden brown. In a saucepan melt the butter and lightly fry the onion until it becomes translucent; add the rice, stir and ensure the rice is coated well. Then, add the white wine and cook until it evaporates. Next, add a ladleful of the hot broth and simmer, stirring continuously. When the stock is absorbed add more when necessary. Continue in this way for about 16 minutes. Remove from the heat, add the grated parmesan cheese, adjust salt and pepper to taste and stir to a creamy consistency. Finally, add the fried aubergine cubes and serve.